A Perfect Christmas? Hmmm...Yes, it's possible as The Grove by Rockwell’s How to Plan a Perfect Christmas will show you all that it takes to make this season stellar. Indulge your Christmas cravings with the Power Plant Mall’s famous Bakers Dozen will visit The Grove –try any number of the enticing treats to be found amongst the smorgasbord of pastries and cakes. Have your favorites wrapped up to be given as gifts to sweet toothed family and friends. Special and unique items from Santa’s workshop can be found at this one-of-a-kind Christmas bazaar. There’s sure to be the perfect gift for anyone on your Nice (or even Naughty) list. Make everyone’s Christmas happier simply by getting your loved ones something personal and heartfelt. Save some time by dropping your gifts off at the wrapping station by the Wrap Shop. Let the lovely wrappers and ribbons adorn the bottom of your Christmas tree as you get your choices from the bazaar packaged beautifully. Excite all your friends and especially the kids as they eye and shake those boxes with glee. 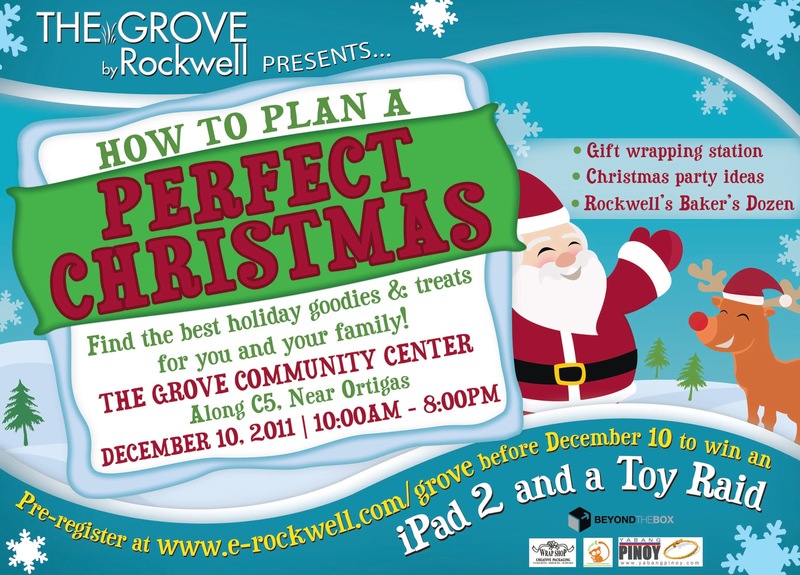 Pick up your feet and really get giddy this year with How to Plan a Perfect Christmas at The Grove Community Center along C5, Near Ortigas on December 10, 2011 from 10:00am – 8:00pm. Visit www.e-rockwell.com/grove to pre-register and get a chance to win a Toy Raid with Toys ‘R’ Us or a brand new iPad 2 from Beyond the Box. For inquiries, visit The Grove Community Center along C5, near Ortigas Avenue or call 571-8151. For online inquiries, visit www.e-rockwell.com/grove. P.S. I'm sharing this press release in behalf of Campaigns Public Relations Inc./ CAMPAIGNS & GREY.